ITV’s award winning comedy Benidorm has been re-commissioned for a sixth series and is currently filming on location. Returning to enjoy the four star hotel treatment are Mick Garvey (Steve Pemberton), Janice Garvey (Siobhan Finneran) and Madge Harvey (Sheila Reid). Viewers will be surprised to see how grown up Michael Garvey (Oliver Stokes) has become – he’s now an adventurous teenager who’s set to cause his parents many troubled afternoons by the pool. It’s all change in series six with the arrival of the Dykes, a brand new family set to stir things up at the Solana resort. Heading up the new family are Clive (Perry Benson) and Tonya (Hannah Waddingham) – a lively Watford couple with Clive firmly under the thumb of his no nonsense wife. They bring their two children with them, Bianca (Bel Powley) and Tiger (Danny Walters) - both are young, single and looking for fun!. Other favourites returning are popular swingers Donald Stewart (Kenny Ireland) and Jacqueline Stewart (Janine Duvitski) who intend to claim their free holiday that Joyce Temple Savage (Sherrie Hewson) promised them at the end of the last series. Hunky barman Mateo (Jake Canuso) still holds the fort behind the pool bar with the help of friendly transsexual Les/Lesley (Tim Healey). Liam (Adam Gillen) has now joined Kenneth DuBeke (Tony Maudsley) at his hair salon ‘Blow & Go’ – the very discreet and selective hair and beauty emporium within the Solana resort. Later in the series will see the return of Martin Weedon (Nicholas Burns) who arrives on a loud and lairy stag do – he was last seen at the Solana resort in series 3. He’s very single on this occasion and finds himself having a ‘drunken encounter’ with one of the known female holidaymakers. Benidorm is also known for it’s guest visitors and series six will be no exception with the return of Matthew Kelly as Cyril Babcock and the arrival of Ken Morley and Phillip Olivier playing new characters. 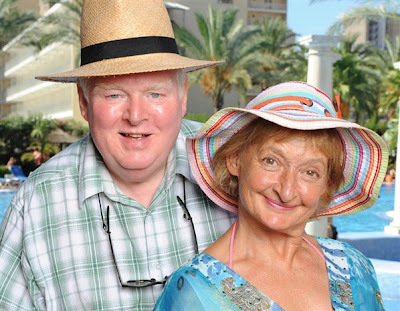 The show’s creator Derren Litten has written all 7 episodes of the new series – "I'm so excited about series 6 of Benidorm, probably more excited than all previous series. Apart from Dynasty series 5 of course, what could possibly top the Moldavian Massacre?" says Derren. Benidorm has been commissioned for ITV by Elaine Bedell, ITV’s Director of Comedy & Entertainment and Comedy Commissioning Editor Myfanwy Moore. Myfanwy Moore says “ "We are all thrilled at ITV to be sharing the sun beds again with our most popular and enduring comedy characters. This series promises to be the sunniest and strongest ever!"